Grandezza, Estero Fl 33928 is a gated golf and country club community which boasts 550 acres of tropical beauty including sparkling lakes and natural preserves. The distinct communities offer residents a variety of Grandezza real estate including single family homes, villas, carriage homes and condominiums. The tropical landscape is amazingly beautiful. Every resident has the opportunity to join the club as a Golf Member, Sports Member or Social Member. The Darwin Sharpe III picturesque par 72 championship golf course is a focal point of the community. The professional golf course is a natural preserve for oak.pine trees, marshes and wildlife species that have lived in the area for hundreds of years. Players of all levels will have the opportunity to challenge themselves on this beautiful course that features undulating greens, rolling fairways with sharp elevations. An aqua driving range is also available. Grandezza is located in zip code 33928. A luxurious, recently redecorated, 53,000 square foot clubhouse is accented with ostentatious furniture, beautiful floral arrangements and traditional European murals. Outside are lush strolling gardens and terraces that provide indoor and outdoor dining. A resort style pool, spa, pro shop, fitness center, six har-tru tennis courts and walking paths. You and your out-of-town guests will enjoy our proximity to SW Florida International Airport, Coconut Point Mall, and Gulf Coast Town Center. Many local hotels also offer a shuttle service to and from their locations to Grandezza. From private celebrations to Grand events, Grandezza is the premier event site in SW Florida. Whether it’s your Wedding, Bar or Bat Mitzvah, Family Reunion, Holiday Party or any other special occasion; This community is the place to have it. With scrumptious menus, impeccable service it is a great place to have a party. Home and Condo prices are rising. You may want to consider buying Grandezza real estate for sale soon! Feel free to Contact Shellstar Realty. Our Realtors Have several years experience and can help you obtain the best price on your real estate purchase. Our Grandezza MLS listings are updated Hourly! 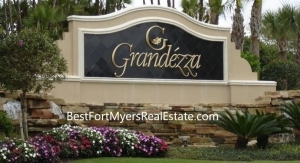 Grandezza, Estero FL Real Estate – Easy to use and Up to Date MLS search!